SOUTHERN PECAN PIE FOR THE HOLIDAYS! Pecans are native to the American South, and you can bet those creative Southerners put them on the menu every chance they could find. Those delicious little pecans even made the South famous for its pecan pie, an irresistible dessert that makes ex-pat Southerns very homesick. Many Southern families have their own treasured family recipe–possibly even some handed down from grandma’s or great-grandma’s secret recipe. Years ago, family recipes were so cherished many were kept secret. I have great respect for those delicious heirloom recipes that bring families together at special times like the holidays. And I also love the way Southerners say pecans– south of the Mason-Dixon line they call them puh cons. 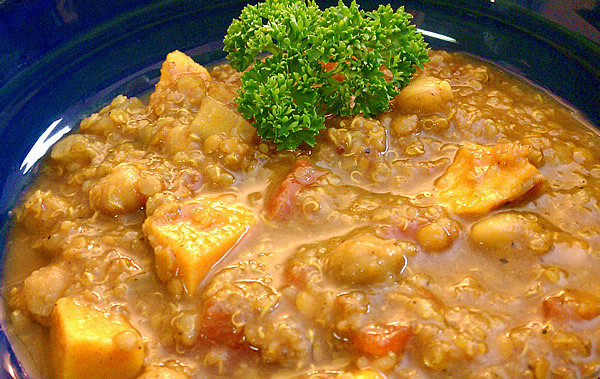 My holiday version has all the eye-appealing and flavorful attributes of its traditional counterpart with the added benefit of being totally vegan. But I must admit that veganizing the recipe was one heck of a challenge. My first 8 attempts–yes, it actually took 9 tries to get it right–came out too runny or totally soupy. It was maddening and totally frustrating, but I was one determined gal. The goal was to find a way to thicken and bind the ingredients, as eggs would do in the traditional recipe. About the 8th time the top baked perfectly, and I thought I had achieved success at last. But, no! As soon as I cut into it, it was soup. Taking the place of the eggs is a combination of tapioca flour and flaxseeds that gives the pie its unique, creamy texture. The tapioca flour also performs the double duty of thickening the filling as well as providing an inviting glaze that enhances its appeal. The key was tapioca flour –it worked like magic! 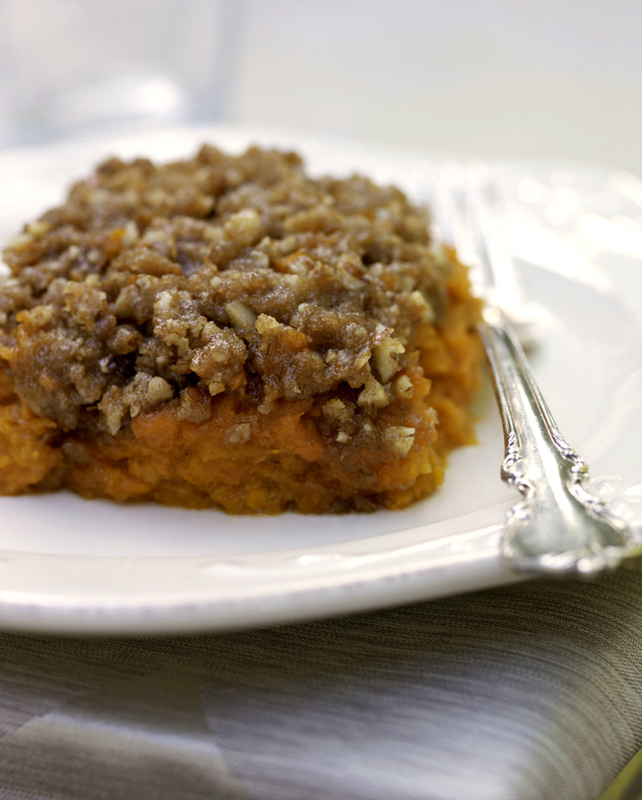 Now I’m thrilled to share this recipe that’s from my cookbook The Nut Gourmet. There are many ways to arrange the pecans on the top. Some people simply sprinkle broken pieces over the filling, but I wanted a pecan pie that was pretty darned eye appealing. If you have the time, start by sorting out beautiful pecan halves of similar sizes for the topping. Then arrange them side-by-side in concentric rings beginning in the center of the pie. At serving time, make way for those pecan lovers who scramble for a piece of pie! 1. TO MAKE THE PIE CRUST, preheat the oven to 350 degrees F. and have ready a large rimmed baking sheet. Combine the pastry flour, almond meal, sugar, and salt in a medium bowl and mix well. 2. Add the oil and mix with a spoon until all the flour is incorporated. Add the water and stir thoroughly until the mixture forms a soft dough and all the water is absorbed. 3. Form the dough into a ball and roll it out between two sheets of waxed paper. Remove the top sheet of waxed paper, place the pie pan over the dough, and invert the dough and pan together. Remove the waxed paper carefully and firm the edges of the crust. Trim the excess crust with a knife. Bake the Crust for 5 minutes and set it aside on the baking sheet to cool. 4. TO MAKE THE PECAN FILLING, put the coarsely broken pecans on a small, rimmed baking sheet and toast them in the oven for 8 minutes. Immediately pour them onto a dish to cool. When cool, spoon the pecan pieces into the bottom of the pie shell. 5. Melt the margarine over medium heat in a 2-quart saucepan. Add the corn syrup, brown sugar, and vanilla extract and bring to a full boil over medium heat, stirring frequently. Boil 5 minutes and set aside to cool for about 30 minutes. 6. Put the soymilk in a small bowl and stir in the tapioca flour. Set it aside for 5 minutes to allow the tapioca flour to absorb some of the liquid. Don’t rush this step. The tapioca flour needs a full 5 minutes to absorb some of the liquid. 7. Meanwhile, put the flaxseeds in a blender or mini chopper and grind them to a fine meal. Add the flaxseeds and the soymilk mixture to the cooled corn syrup mixture. Stir to combine, and pour the mixture into the blender. Blend for 1 minute, until smooth. Pour over the toasted pecans. 8. 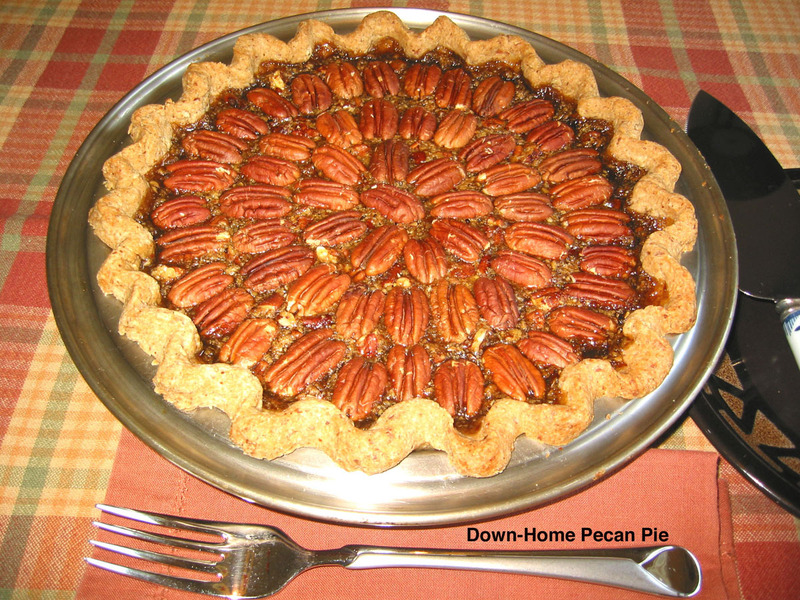 Top the pie with the pecan halves, arranging them in concentric circles, beginning in the center. Bake for 40 minutes. Cool thoroughly before chilling in the refrigerator. The pie will firm after it is thoroughly chilled. RESEARCHERS GO NUTS OVER ANTIOXIDANTS! 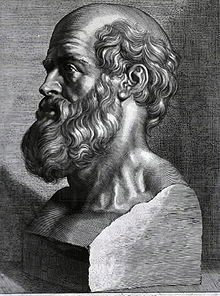 Hippocrates (480 BCE-370 BCE), the Father of Western medicine, had the secret of antioxidants in a healthy diet, even though he may not have known it when he said, “Let food be thy medicine and medicine be thy food.” He knew the power of foods from nature was both healing and preventive and emphasized that message to his followers. Though he didn’t have the scientific knowledge that foods from nature, such as tree nuts, contained powerful antioxidants, he witnessed healing taking place when patients ate pure whole foods. He recognized those foods contained remarkable elements that could not only prevent disease but also restore vigor. Fresh, plant-based foods (nuts, seeds, fruits, vegetables, whole grains, and legumes) do, indeed, contain powerful plant chemicals packed with antioxidants. What are these antioxidants and what can they do? While all plant-based foods contain these powerful healing elements, recent research has revealed the impressive antioxidant potential in tree nuts. Intensive tree nut studies have uncovered an array of antioxidant chemicals including lignans, napthoquinones, phenolic acids, phytosterols, polyphenols, flavonoids, proanthocyanidins, and tocopherols that can reduce inflammation in the blood, lower cholesterol, act against viral invasion, and protect the body from tumor growth. Because we now know that antioxidants can scavenge and prevent unstable molecules called free radicals from destroying our cells, we can take joy in devouring a delicious handful or two of tree nuts every day to reap the many benefits from their excellent antioxidant properties. 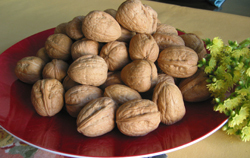 In a 2009-study published in the Journal of Human Nutrition and Diet, researchers tested thirteen subjects to study the effect of a polyphenol-rich diet of walnuts or almonds on the blood. The subjects fasted overnight, had blood tests, and then were given either a walnut or almond smoothie or one that contained no nuts. After a week, each participant switched to a different smoothie, and each time, blood was tested several times after beverage consumption. Researchers found a noticeable increase in polyphenols, a type of antioxidant, after subjects consumed the nut-based smoothies, but no change following the nut-free beverage. Noted were a significant increase in total antioxidant capacity and a reduction of blood oxidation in those participants consuming the polyphenol-rich nut smoothie. In another study conducted at Loma Linda University, meals including whole pecans and blended pecans were compared with a control meal with no nuts to test for antioxidant activity. This small trial of sixteen healthy men and women used the crossover method where participants were given each meal at controlled intervals with a week in-between. Blood levels of tocopherals, the vitamin E antioxidant, doubled in those consuming whole and blended pecans, while antioxidant levels increased 12% and 10% respectively two hours after consumption. 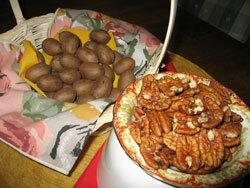 After meals including whole pecans, LDL oxidation decreased considerably after consumption. Triglycerides decreased only after the participants ate whole or blended pecans in their meals. When nuts are commercially roasted in added fats, like partially hydrogenated oils that contain trans fats or coconut or palm oils that are high in saturated fats, they raise the risk of heart disease by elevating the bad cholesterol that can deposit plaque in the arteries. 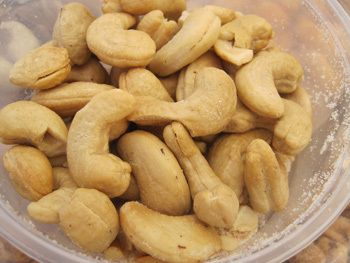 Commercially roasted nuts may also be roasted at high temperatures that possibly damage or reduce antioxidant levels. Dr. Joan Sabate, professor of nutrition at Loma Linda University, and colleagues examined 25 nut studies from other countries. Their nut research has shown that regular consumption of nuts reduces the risk of coronary heart disease in several ways: lowering cholesterol levels, improving endothelial function, lowering oxidation in the blood, and reducing lipoprotein(a) levels. The researchers focused both on subjects with normal and high cholesterol and noted that nut consumption led to a marked improvement in both HDL and triglyceride levels. Along with their exceptional nutritional qualities, nuts contain an array of phytonutrients or plant chemicals with high antioxidant capacity. 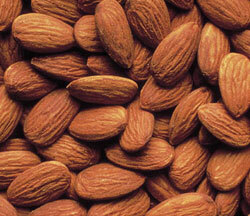 An almond study at Tufts University unveiled 20 powerful antioxidant flavonoids in almond skins. Some of the flavonoids were the same antioxidants found in familiar foods like green tea that contains catechins and grapefruit that includes naringenin. The research team tested the antioxidants separately and together on blood samples that contained LDL cholesterol. Flavonoids in the almond skins improved the LDL resistance to oxidation by 18%, but when tested together with vitamin E in the meat of the almond, the resistance to oxidation increased by 52.5%. This research illustrates the benefits of the synergy that occur in nature and the importance of eating the whole nut, including the skin. Which nuts lead the antioxidant parade? 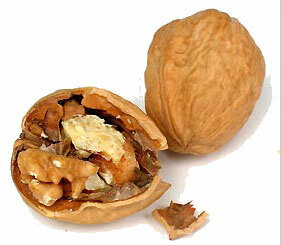 Of all the tree nuts, walnuts, pecans, and chestnuts contain the greatest amount of antioxidants. 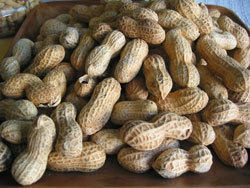 Although peanuts are technically legumes, they are nutritionally similar to nuts. Like walnuts, peanuts are packed with high levels of antioxidants. Be sure to consume nuts whole to gain their full benefit, since much of the antioxidants are contained in the skins. Antioxidants and plant chemicals are not the only healthful attributes of nuts. Nuts are an excellent source of protein, a quality that has placed them in the USDA MyPyramid Dietary Guidelines for Americans alongside meat, poultry, and fish. Nuts are also a powerhouse of minerals including calcium, magnesium, potassium, iron, zinc, selenium, and copper that work as a cooperative team to bring excellent health and maximum immune function to the body. It’s easy to include nuts in the diet. Nut researchers are now finding that two handfuls a day of tree nuts are better than one at delivering health benefits. Enjoy them as a snack, sprinkled in salads, blended into smoothies, ground into salad dressings, blended into nut milk, or included in muffins, cookies, and confections. Buy them raw and keep them in the refrigerator for freshness. Though people tend to gravitate to one or two favorites, they will benefit from a variety of nuts because each kind contains different quantities of minerals, good fats, and beneficial antioxidants. To enjoy roasted nuts, consider roasting them at a low temperature to preserve their valuable vitamin E and antioxidant flavonoid and polyphenol contents. Place the nuts on a baking sheet and dry roast them at 150 to 170 degrees F. for 15 to 20 minutes. Transfer the nuts to a dish to cool and taste their exceptional flavor and pleasantly crisp texture. Antonio AL, Ferreira IC, Bento A, Botelho ML. “Influence of Gamma Irradiation in the Antioxidant Potential of Chestnuts (Castanea sativa Mill.) Fruits and Skins.” Food and Chemical Toxicology. 2011 Feb 28. Barreira, J.C.M., Ferreira, I.C.F.R., Oliveira, M.B.P.P., and Pereira, J.A. 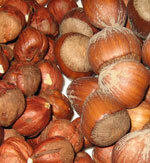 “Antioxidant Activities of the Extracts from Chestnut Flower, Leaf, Skins, and Fruit”. Food Chemistry: 104:(3), 1106-1113. Bolling, B.W., McKay, D.L., Blumberg, J.B. “The Phytochemical Composition and Antioxidant Actions of Tree Nuts.” Asia Pacific Journal of Clinical Nutrition. 2010; 19(1):117-123. Chen, C.Y., Milbury, P.E., Lapsley, K., Blumberg, J.B. Flavonoids from Almond Skins are Bioavailable and Act Synergistically with Vitamins C and E to Enhance Hamster and Human LDL Resistance to Oxidation. Journal of Nutrition. 2005; 135(6):1366-73. Hudthagosol, C., Haddad, E.H., McCarthy, K., Want, P., Oda, K., Sabate, J. 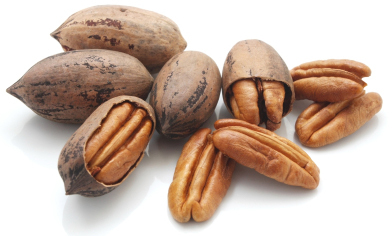 “Pecans Acutely Increase Plasma Postprandial Antioxidant Capacity and Catechins and Decrease LDL Oxidation in Humans.” Journal of Nutrition. 2011. Jan: 141(1): 56-62. Sabate, J., Oda, Keiji, Ros, Emilio. “Nut Consumption and Blood Lipid Levels; A Pooled Analysis of 25 Intervention Trials.” Archives of Internal Medicine. 2010;170(9):821-827. Sloan, Carol Berg, RD. “Roasting Walnuts.” Email from the author responding to my inquiry to the California Walnut Commission about whether roasting walnuts lowers their antioxidant levels. 15 May 2011. Torabian S, Haddad E, Rajaram S, Banta Jim, Sabaté J. “Acute Effect of Nut Consumption on Plasma Total Polyphenols, Antioxidant Capacity and Lipid Peroxidation in Healthy Volunteers.” Journal of Human Nutrition and Diet 2009, 22:64-71. CATCH THIS NUTTY HUG, ASHLEY! 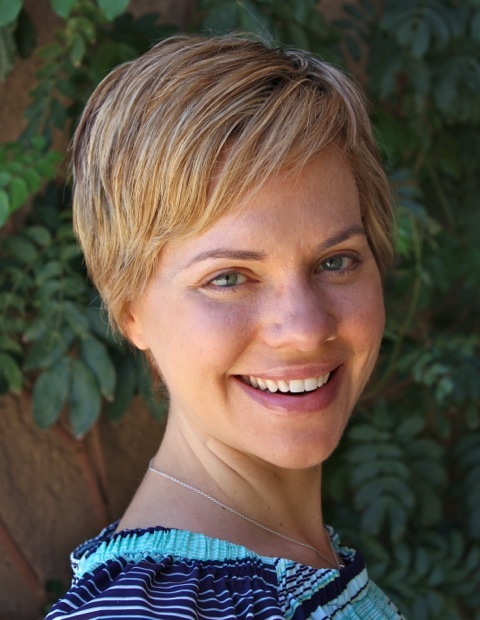 What a kick it was to receive a Google Alert leading me to a delightful blog authored by Ashley, a zesty blogger. The alert came to my inbox because Ashley received a copy of my cookbook, The Nut Gourmet, from the publisher, Book Publishing Company, and made one of my unique nut-based recipes—BEAN BUTTER. She loved it and shared her bubbly response on her blog. 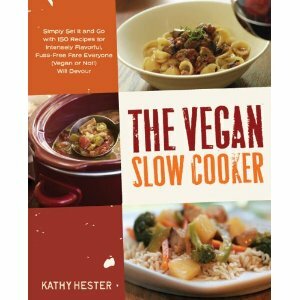 She even posted a photo of the book cover and took photos of the recipe in progress as it whirled in the food processor, traveled to a bowl, and finally ended up in her dish cuddled up next to a yummy banana. When I read her upbeat comments on the book and the recipe, I was thrilled, naturally. We live in a world where so many people choose to find fault and criticize others’ accomplishments mercilessly that it was refreshing to read the good stuff—really positive, feel-good words. I can’t deny that it stroked by ego—honestly, it did—those sweet words made me smile a good long time and gave me double the happy outlook I normally have. Since I created The Nut Gourmet, I’ve become so much more empathetic with other cookbook authors. Now that I’ve experienced the trials, successes, flops, and frustrations that go into developing an average of 150 recipes for a cookbook, I am ever so grateful for the sweet kudos that come my way. Thank you Ashley, from the bottom of my heart. Now it’s my turn to share. Here’s Ashley’s blog Food, Fotos, and Fun! Drop in for a visit and browse. Now, for some more sharing. You, too, can enjoy the ever-so-nutty Bean Butter that features pecans–the favorite nut of Southern U.S.A. Combining unlikely ingredients often turns up pleasing results. Blending beans, dates, and pecans provides the base for a delectable spread that goes especially well with earthy breads like rye, whole wheat, or multigrain. For an ideal snack to serve the kids, spread Bean Butter on two slices of bread, then slip sliced bananas or thinly sliced apples in between to make a tasty, quick-fix sandwich. Combine all the ingredients in the food processor and process until thick and smooth. Stop the machine occasionally to scrape down the sides of the work bowl and redistribute the ingredients. Add more water, 1 tablespoon at a time, for a creamier, softer consistency. For a sweeter spread, add more dates. As autumn approaches each year, I get a little antsy for freshly harvested nuts in the shell to reach the grocery store. This year’s fresh crop has arrived and is well worth the wait! Showing off their glorious colors, fresh nuts are noticeably more delicious—they’re sweeter, more moist, and have a distinctly fresh flavor. Don’t get me wrong; the nuts from last year’s crop are still great and have been stored with care to preserve them. It’s just that the fresh ones pop with flavor that compels me to keep reaching for another and another. If you’re not a nut like me, you may not have noticed them yet—beautiful walnuts in their plump wrinkly shells that remind me of brains, almonds in their pitted golden shells with raggedy edges, pecans enclosed in deep red shells that look as if they’d been dyed, little round sable-colored hazelnuts that have a sort of musical sound when they clink together, and Brazil nuts with their large exotic-looking triangular chocolate brown shells that are a challenge to crack. Sometimes I find bulk nuts piled into individual bins in the produce section, one bin for the walnuts, another for the almonds. But in recent years I found the nuts attractively packaged in three to five-pound mesh bags as a stunning, colorful mixture. I take them home and empty them into a sturdy woven basket with a strong handle. I call it my nut basket because I’ve outfitted it with the wildest selection of nutcrackers you’ve ever seen. Friends who know I’m deeply into nuts have contributed an amazing array of nutcrackers to my collection that seems to joyfully multiply each year. 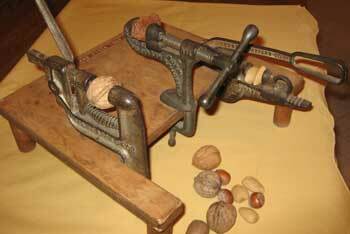 There’s a special one that cracks walnuts with one squeeze and another that’s made for cracking macadamias. I have three very old nutcrackers that operate on the vice principle—no, those nutcrackers don’t do surgery on anyone—not even the Vice Principal—I was actually referring to the ones that simply work like vices where I place a nut between two metal parts and turn a crank to tighten the space between. Those three nutcracker vices are true antiques, rusted to perfection, wearing their 109 years with elegant dignity, and still working stalwartly. I also buy bulk nuts already shelled for serious baking, but there’s something deeply bonding about sitting at the table with friends and placing the nut basket between us. It doesn’t take long before the ballet begins—the nut-cracking ballet, that is. You know, it’s the Nutcracker Sweet, and is it ever sweet. Pretty soon, there’s a giant pile of nut shells on the table, and still we reach for another nut, and then, another. Nuts have a special way of bringing friends closer. They seem to invite sharing, not only the nuts themselves, but I’m often surprised at the conversations that flow after the first few nuts have been opened and tasted. Because of these opportunities, I’ve come to equate nuts with friendship. 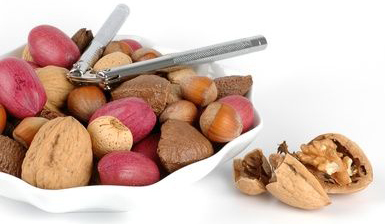 During this holiday season, play the Nutcracker Sweet, enjoy good friends, and keep the nut basket handy. Now, I really must go—my pistachios are calling! I don’t know if Thanksgiving is wild and crazy to the max at your house, but it sure is in mine–in a good way, that is. It’s our family reunion time, so I have family flying in from all parts of the globe for this nutty feast. All the bedrooms are full and the kitchen is in a constant state of activity. It’s been our thing for years so we really look forward to Thanksgiving week—a time that’s filled with lots of cooking going on, great aromas drifting through the house, lots of eating, and lots of laughing. On Thanksgiving day the frenzy picks up and we’re all in high gear to get everything ready for that special dinner when we literally pile a ton of colorful, fabulous tasting dishes onto the buffet table that I describe as the groaning board. And we attack with fervor! Front and center on the table is the totally nutty vegan Thanksgiving Torte, our annual feast specialty that I want to share with all who aim for a kind and gentle Thanksgiving. The recipe is from my cookbook, The Nut Gourmet and is pretty darned impressive looking—even if I have to say so myself. It’s a real good looker, especially when I serve it on a footed cake plate and garnish the heck out of it with sprigs of fresh herbs and orange slices. 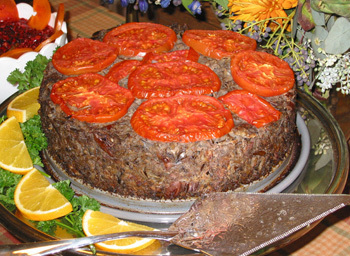 The Torte makes the ideal vegan Thanksgiving dish with its varied textures and savory flavors from the combination of wild rice, mushrooms, nuts, and sage. Served with a robust Mushroom Gravy on the side, the Torte makes a very hearty main dish and goes well with all the typical side dishes like cranberries, gravy, sweet potatoes, chestnut stuffing, and a few veggie combinations. For dessert, its pumpkin and apple pies, of course. To ease the feast-day preparations, I usually make the Torte the day before, store it in the fridge, and reheat it at 350 degrees for 15 to 20 minutes before serving. One little hint, the Torte preparation comes together more quickly if you cook the wild rice before beginning the torte or even the day before. 1. TO MAKE THE TORTE, lightly oil a 9-inch springform pan, line the base with parchment paper (for easier cleanup), and set it aside. Combine the 2 cups water, wild rice, and salt in a 2-quart saucepan. Cover and bring to a boil over high heat. Reduce the heat to medium-low and steam for 45 to 50 minutes, or until the rice is tender. Drain off the excess liquid and set the rice aside. 2. Combine the potato cubes, 1 cup water, and salt in a 2-quart saucepan. Cover, and bring to a boil over high heat. Reduce the heat to medium and simmer for 5 to 7 minutes, or until the potatoes are fork tender. 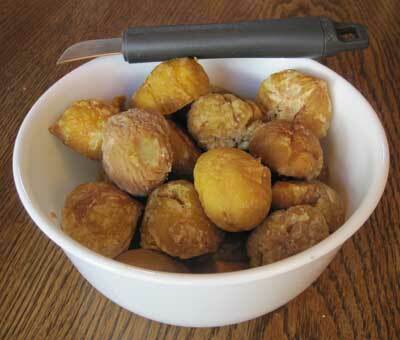 Using a slotted spoon, transfer the potatoes to a medium bowl, mash them, and set them aside. 3. Preheat the oven to 375 degrees. Toast the pecans and walnuts in a 10-inch skillet over high heat, stirring constantly for 1 to 2 minutes. Immediately transfer them to a dish to cool. 4. Combine the vegan sausage, mushrooms, onion, the 1/3 cup water, olive oil, poultry seasoning, and pepper in a large, deep skillet. Cook over high for 5 to 7 minutes, or until the onion is transparent, stirring frequently with a wooden spoon or paddle to break up the sausage chunks. Drain and reserve any excess liquid. Add the salt and hickory liquid smoke to the sausage mixture and mix well. 5. Add the mashed potatoes to the skillet along with the toasted nuts and cooked wild rice. Mix well to combine the ingredients thoroughly. Adjust seasonings if needed. 6. Press the mixture firmly into the prepared springform pan, and attractively arrange the tomato slices over the top, covering most of the surface. Bake uncovered for 1 hour. Allow the torte to stand for 15 to 20 minutes before removing from the pan. 7. TO MAKE THE MUSHROOM GRAVY, prepare it while the torte is baking. Combine the mushrooms, water, soy sauce, red wine, and lemon juice in a 2-quart saucepan and bring to a boil. Reduce the heat slightly and simmer for 5 minutes. 8. Combine the cornstarch and water in a small bowl and stir with a spoon to make a runny paste. Add the paste to the bubbling gravy, a little at a time, stirring constantly, for about 1 minute, until the gravy has thickened to the desired consistency. My friend, Chef AJ, teaches healthy vegan cooking classes. At the end of a special 6-week session, she inspired her students to take on a unique challenge—to create their own, from-scratch NUT BALL recipe as a dessert treat. To make this challenge even more exciting, she gave them a deadline and said there would be a contest and an enticing prize. Chef AJ gave her students a rough recipe for the Nut Balls and asked that they design their recipe without any kind of traditional sweetener—only dates. There were no restrictions on ingredients—only that they be natural, unrefined, and unprocessed. On the evening of Sunday, April 4, three of us intrepid tasters participated in judging this unique and very spirited event—my husband and I and Kimberly Elliott (because she hates healthy food and will only eat stuff that tastes really great.) Of AJ’s nine students, five of them entered their creations and made enough Nut Balls for all of the 15 to 20 attendees to taste as well. Though the event took on a raucous party-like atmosphere, there was a serious edge to the contest–the judging was to be based on appearance, taste, and creativity. The entire group also voted. Knowing what lay ahead, my husband and I ate lightly for dinner to keep our palates refreshed and clear. Each of the Nut Balls was innovatively conceived, deliciously indulgent, and looked visually engaging, but two recipes stood out from the rest for their exceptional taste and out-of-the-box creativity. 1. 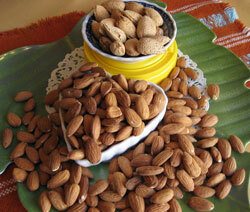 Grind the 1 1/2 cups of raw almonds to a fine meal in the food processor and transfer to a large bowl. 2. Add the macadamias, pineapple, apricots and the 1/2 cup chopped almonds to the bowl. 3. Chop the dates and add them to the bowl. Mix well until the mixture becomes sticky. 4. Form the mixture into 1-inch balls by rolling between the palms of the hands, then, roll the balls in the flax seeds to coat them completely. Place the balls into a covered container and freeze. Serve the balls frozen, partly defrosted, or room temperature. Note: If you prefer sweeter balls, add more dates to taste. 1. Combine all the ingredients, except the dried coconut, in the food processor and process to a fine or slightly chunky consistency, adding the date soaking water as needed to moisten and bind the ingredients together. 2. Form into balls by hand and roll each one in the ground coconut. Place the balls into a covered container and put them into the freezer. Serve frozen or room temperature. Note: Dried cranberries would also make a tasty addition. 1. Place the cashews and sunflower seeds into the food processor and process them until they are finely ground. 2. Add 1/2 cup of the cacao powder, the dates, and the cherries to the food processor and process until all the ingredients are finely ground. 3. Form the mixture into 1-inch balls by rolling between the palms of the hands. Place the remaining cacao powder into a bowl and roll the balls in the powder, coating them completely. 4. Place the finished balls into a covered container and freeze them. Serve them frozen, partially thawed, or room temperature. Note: The balls are quite firm and dense. Soaking the dates or cherries or both will create balls with a more moist texture. 1. Combine the nuts, seeds, and cacao powder in the food processor and pulse briefly. 2. Add the dates, cacao nibs, and vanilla extract and process until the mixture becomes well blended and sticky. 3. Form the mixture into 1-inch balls by rolling between the palms of the hands and then roll them in cacao powder. Place the balls into a covered, shallow, plastic container and freeze them. Serve frozen, slightly thawed, or room temperature. 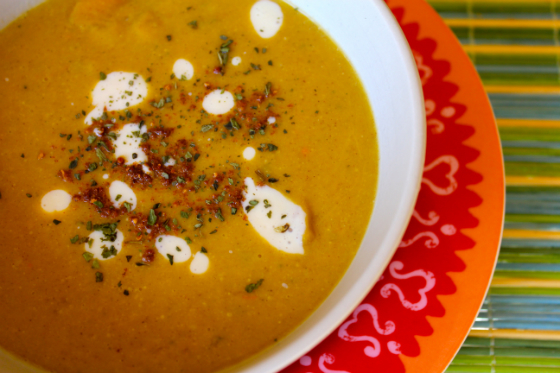 Note: To vary the recipe, use pumpkin seeds, hemp seeds, or a mixture in place of the sunflower seeds. Other dried fruits like goji berries or cherries may be used instead of or in addition to the dates. 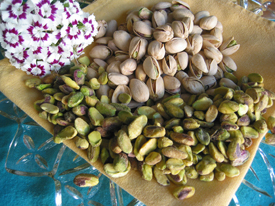 My recipe was the same as Pamela’s, but I used raw pistachios instead of the raw almonds.